This entry was posted in Uncategorized and tagged 1995, Charlie Rose, Leonard Nimoy, Star Trek. Bookmark the permalink. Such a lovely interview Therese. Makes us miss even more. Thanks for finding this gem. Ever wondered what kind of redesign Scotty might have produced for the good old Enterprise after way too much Scotch? I guess Paramount’s lawyers either didn’t know about this foreign (probably Chinese) knockoff, or decided they’d never get enough money out of what was probably a fly-by-night company to make the effort worthwhile. 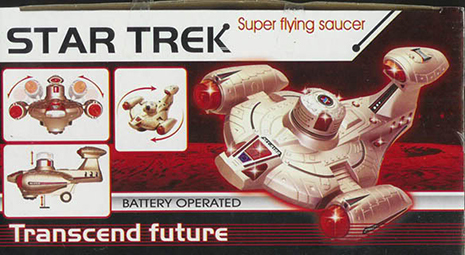 This, and many other knock-off toys of various franchises, can be found in this article from the blog Dangerous Minds. LOL!! I’ve actually been collecting images of Trek merchandise for posts here, and that’s a definite candidate! Thanks Kid! Wow! Thanks so much for digging up this interview. I loved Mr. Nimoy’s summary of Star Trek as “a moral society,” and this was the first I’d ever heard that he was writing a novel! I wonder if he ever finished it or what ever became of it. I’ve read most of Mr. Nimoy’s poetry, and I thought it was more earnest than skillful, but it certainly showed him to be a sweet, lovely, and thoughtful person. Even if his novel were also more earnest than skillful, I’d love to read it, to see what it reveals about its author.